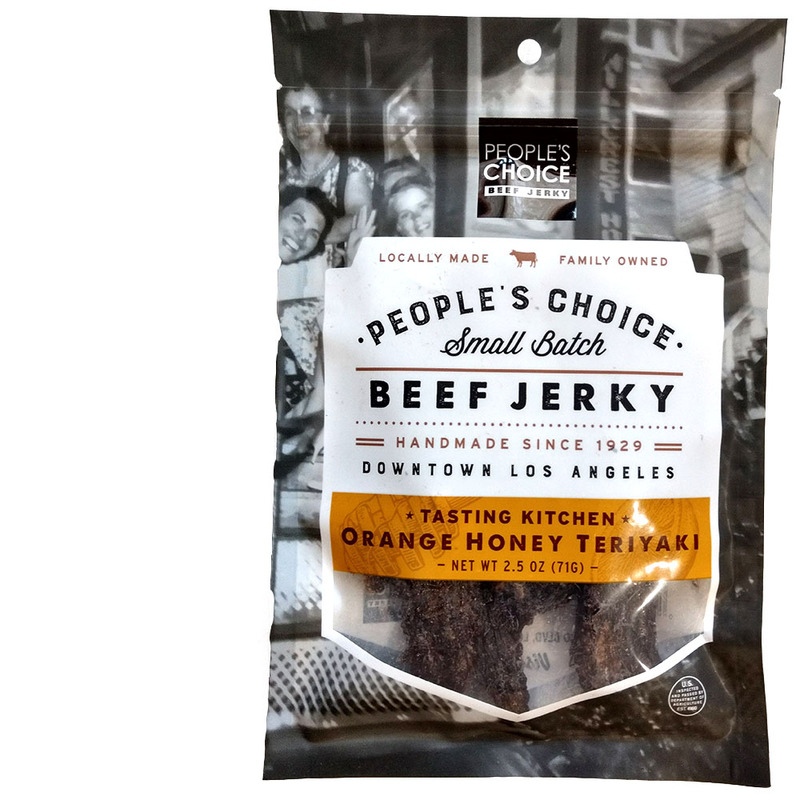 People's Choice Beef Jerky makes a flavor, "Orange Honey Teriyaki". 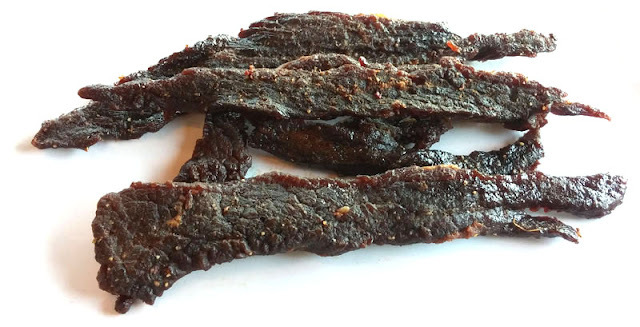 This Orange Honey Teriyaki is part of the company's "Tasting Kitchen" series, which is a line of jerky that mixes bold, eclectic ingredients, with the old fashioned style of making jerky. People's Choice says that this variety "...introduces a ping of sweetness and citrus from the honey and orange flavor... ...slowly brings through the more savory aspects of the Teriyaki sauce such as the spices and soy sauce. A subtle touch of ginger lingers in the mouth." The first flavor I taste on the palate is a sweet teriyaki mixed with orange zest. A light saltiness comes on. The chewing brings on a bit more citrusy flavor, but with a noticeable honey. A light bit of natural meat flavors makes a showing, and a light black pepper in the background. For being advertised as "Orange Honey Teriyaki", this really holds up well. The orange is quite noticeable, mostly as zest, but also a citrusy character in the chewing. The teriyaki mixes well with the orange, adding a tangy, fruity character. The honey is well distinguishable, and not only as sweet, but through its own warm, caramel-like characteristics. Overall, the primary taste profile is a zesty, citrusy, teriyaki sauce, with a sticky sweet glaze, and a layer of honey flavor. Add to that a light black pepper spice and the natural meat flavors. The meat consistency is excellent. There's some light spots and streaks of fat, but otherwise, very meaty. The chewing is tender, yet still offers some chewiness the way jerky should. 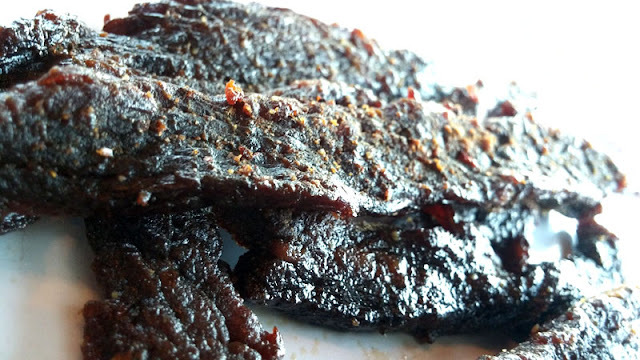 The chewing starts out meaty, and eventually softens up to resemble real chunks of steak. The light bits of fat add touches of flavor. It's rather sticky to the touch. This new Orange Honey Teriyaki from People's Choice Beef Jerky tantalizes the palate with a lively, new interpretation of a classic beef jerky favorite. I love how this variety delivers all of its advertised flavors with knock-out punches. Think of this as a teriyaki jerky with a strong dose of zesty orange but warmed up with smooth, caramel-like characteristics of honey. But more than that, this jerky feels like real meat, and chews like real steak. Together with an exciting flavor and excellent meat consistency, this new entry from People's Choice is a winner.